Syusui Taba creates calligraphy in her studio. 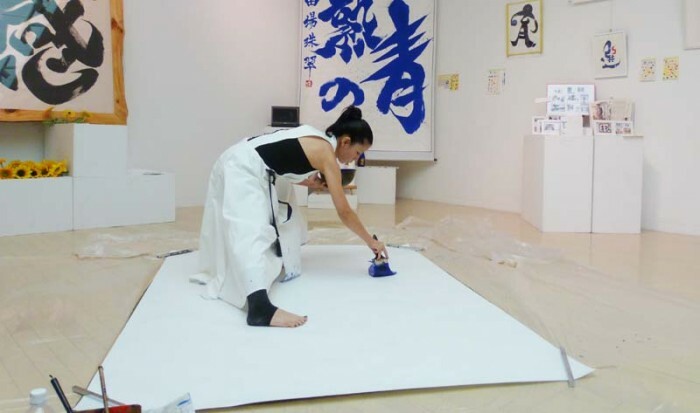 Syusui Taba has been hard at work for months, tweaking her original calligraphy style for the Fudemoji Art Exhibition that opens Tuesday at the Okinawa Prefectural Museum & Art Museum. Her Fudemoji Art Exhibition runs daily 10 a.m. – 5:30 p.m. through June 23rd. On Friday and Saturday the exhibition is open until 7 p.m. in Museum Gallery room 1. Admission is free, including for her Fudemoji performance at 3:30 p.m. Tuesday, 5 p.m. Fri. the 21st and 3:30 p.m. on Sun. the 23rd. Syusui Taba’s works are available for sale during the show as are towel handkerchiefs for ¥500, larger handkerchiefs for ¥800, and her portfolio books for ¥1,300. Those wanting to make a purchase can place an order at the exhibition, and the goods will be delivered them later by mail. The names Taba Syusui or Fudemoji Art may never have been heard of by most people, but Fudemoji Art is the Syusui’s original calligraphy style and font. Those familiar with it say it looks like regular calligraphy, but totally different. Syusui lets each character come to life, and people who watch them feel power flow from each of the characters. That is because her own art style is “Fudemoji Art”, and she is the mother of “Fudemoji Art.” Because she mastered the general basic calligraphy skills, and she could create her own font, she says it is a flowing calligraphy. Syusui Taba was born in Haebaru Town, and started to learn calligraphy when she was only three years old because her older brother did it. She enjoyed it, and the talking topic at home increased her interest in calligraphy. Later, her mother also attended a calligraphy school, so one could say the whole Taba family is into calligraphy. She also received several awards while still a kid. One day, she heard a child at a calligraphy exhibition to say “How can I read this calligraphy? I cannot read it.” That’s when she found that “That’s the answer! I wanted to write a character which is easy to read for everybody, a character which will make people communicate with each other, a character make people laugh!” And she started to create her own style. The “Fudemoji-Art” was born.